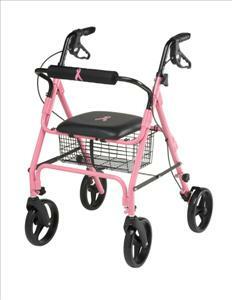 Comfortable padded seat - 12" wide x 12" deep with loop brakes - pull to stop, push to lock. Height adjustable handles adjust from 31.5" high to 37.5" high. The attached basket beneath the seat provides security yet is easily removable to carry with you. Weighing only 15 pounds it's lightweight aluminum makes transporting easy. 300 lbs weight capacity.